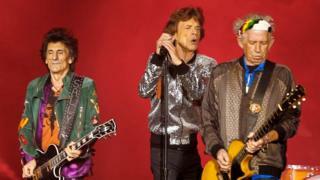 The Rolling Stones have postponed their tour of the US and Canada because Mick Jagger has fallen ill. In a statement, the band said that doctors had advised Jagger not to tour because he needs to receive medical treatment. The 17-concert tour was due to kick off in Miami on 20 April, before travelling across North America until a finale in Oro-Medonte, Canada on 29 June. Jagger, 75, apologised directly to fans on Instagram and Twitter. "I really hate letting you down like this," he wrote. "I'm devastated for having to postpone the tour but I will be working very hard to be back on stage as soon as I can." In a statement to Rolling Stone magazine, the band's publicist said Jagger was "expected to make a complete recovery, so that he can get back on stage as soon as possible". They did not give any details about his illness. The band's No Filter world tour officially started in September 2017 with a concert in Hamburg, Germany. They then toured venues across Europe and the UK through the rest of 2017 and 2018, before announcing the US and Canada leg in November 2018. Tour promoters AEG Presents/Concerts West are telling fans to hold on to their tickets, as they will still be valid at the rescheduled concerts.